Wayne HealthCare, Family Health and Orthopedic Associates of SW Ohio collaborated to offer 2015-16 school year comprehensive sports physicals to Wayne HealthSports athletic contracted schools. 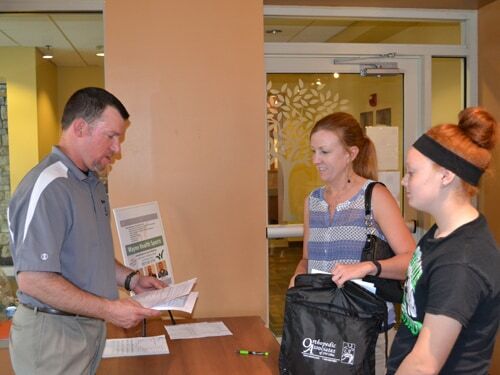 DARKE COUNTY – Wayne HealthCare, Family Health and Orthopedic Associates of SW Ohio collaborated to offer 2015-16 school year comprehensive sports physicals to Wayne HealthSports athletic contracted schools, which included athletes at Greenville, Versailles and Ansonia. Wayne HealthCare has supported local high school athletes since 2012 when it started offering sports physicals. As the medical director for Wayne Health Sports, Safet Hatic, D.O. discussed the new collaboration with Jim Beyke, PT, MPT, director of rehabilitation services at Wayne HealthCare, Lynne Hawley M.D. and Jean Young, CEO at Family Health. It was determined that the organizations would provide collaborative services to athletes to meet the Ohio High School Athletic Association sports participation requirements. All athletes were screened for hearing, dental, vision, height, weight, blood pressure, pulse, behavioral health, orthopedic and general medical examinations. Vaccinations also were offered to athletes who did not have current vaccination records. Student athletes were examined by fellowship-trained orthopedic surgeons, Family Health physicians and other Family Health medical providers. Other professionals participating included Dr. Lucille Hosfeld, Family Health dental staff, Wayne HealthCare athletic trainers and physical therapists, Dayton Sports Medicine Institute, Greenville High School Med Tech students and Greenville Area Emergency Rescue Services. Office personnel from Family Health and Wayne HealthCare were essential to provide registration, traffic flow and record keeping. As athletes completed their physical, they were given a cinch bag, water bottle and educational information from the event sponsors. All of the services were offered at a low cost of $10. With more than 50 providers and volunteers working together, 230 athletes completed their sports physical for the 2015-16 school year. “This year was a new experience for us, however, we were pleased with the athletic directors at each school who communicated with parents and helped students sign up for sports physicals,” said Jim Beyke, director of rehabilitation services at Wayne HealthCare. “We are very pleased to be able to offer the collaborative sports physicals to local athletes. Family Health patients can still schedule a sports physical by contacting their medical provider. Family Health encourages their patients to schedule their sports physicals as soon as possible since many fall sports begin practices during the summer months.